Can I get car finance when blacklisted? We say yes! Many people are afraid that if they have been blacklisted it is the end of their financial opportunities and that they will not be able to get assistance from financial institutions. This may be true when going to a bank formally and asking for a personal loan, or if you need to buy a car in the hope your bank will facilitate the loan process for you. In South Africa, where nearly a quarter of the total population has a poor credit record, it is difficult for people to get loans, especially for a vehicle. 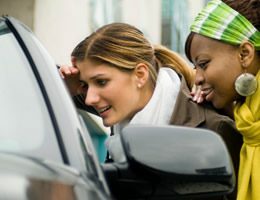 However there is hope for those who have a credit record that cannot be considered “qualified” by banks as there are car finance specialists such as Earn-a-car in Gauteng. Not just for people with poor credit record- but also for those with no credit record at all, Earn-a-car is your best option for purchasing a vehicle. With an experienced team of consultants, Earn-a-car will be able to advise you on the wide range of pre-owned vehicles available. Once you have selected the vehicle you like (after browsing their vehicle options) the process is very simple thereafter. Earn-a-car will be able to give you instant approval based on a few prerequisites. If you are currently employed and are able to get proof of income as well as a minimum deposit of R16 500.00, you will be able to drive away in one of our vehicles in just an hour. For more information on how you can get a vehicle if you are not confident with your credit history, contact us today and drive away in the car you have always wanted, without any hassle or fuss.